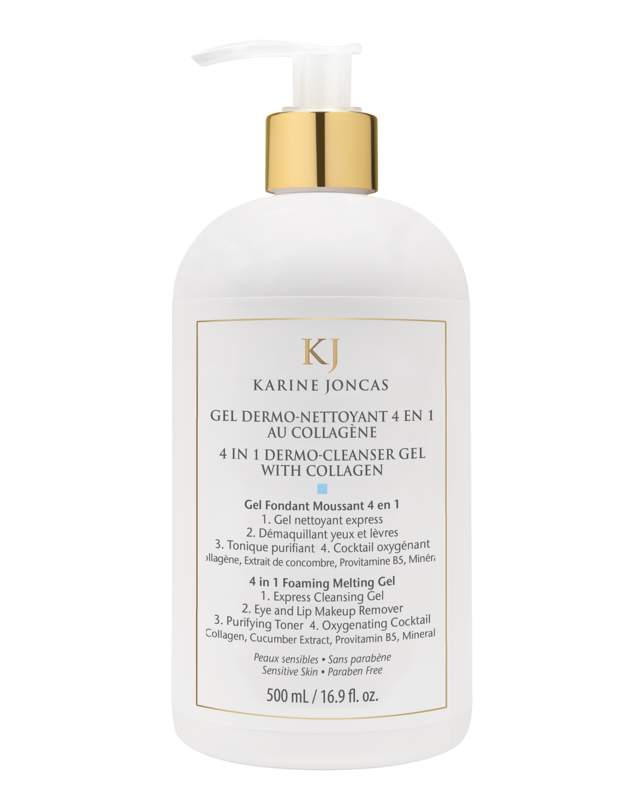 The 4 In 1 Dermo-Cleanser Gel with Collagen deeply cleanses the skin by eliminating impurities, pollution particles as well as all traces of makeup on the face, eyes and lips in a single step. Enriched with collagen, cucumber extract, provitamin B5 and minerals, this express cleansing gel remarkably tones and energizes the skin due to its oxygenating cocktail. Skin looks soft, radiant, purified and refreshed. The formula is suitable for any skin type, even the most sensitive. This intelligent cleanser is a powerful source of vitality that protects the skin’s moisture barrier. Apply to the skin, gently massage to form a lather and rinse with warm water. Dry gently. Aqua (Water/Eau), Glycerin, Sodium Cocoyl Alaninate, Panthenol, Soluble Collagen, Sodium Hyaluronate, Cucumis Sativus (Cucumber) Fruit Extract, Magnesium Aspartate, Zinc Gluconate, Copper Gluconate, Sodium Cocoamphoacetate, Lauryl Glucoside, Sodium Cocoyl Glutamate, Sodium Lauryl Glucose Carboxylate, Xanthan Gum, Acrylates/C10-30 Alkyl Acrylate Crosspolymer, Propylene Glycol, Disodium EDTA, Sodium Hydroxide, Phenoxyethanol, Ethylhexylglycerin.